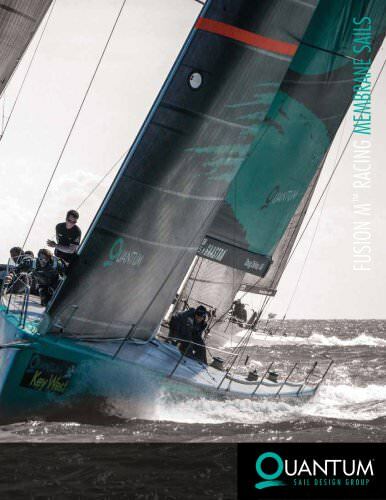 FUSION M™ RACING MEMBRANE SAILS Sail Shape Define geometry of the sail and create mold shape using 3D design program and extensive database of boat and sail types. Aerodynamic Analysis Compute and visualize aerodynamic forces, wind angles and velocities, and the distribution of air pressure using computational fluid dynamic (CFD) calculations. Structural Analysis and Fiber Mapping Evaluate stresses and strains on the sail, rig and rigging with finite element analysis (FEA) and materials data to determine optimal flying shape and fiber layout. Output Design Adjust and refine all elements of the sail design and structure to achieve optimal shape, structure, fiber type, and layout for the finished product. Transfer precise construction specifications to the manufacturing team. Build sails following stringent and precise manufacturing standards and propietary procedures for optimal quality. Validate advancements in design technology and the iQ process through on-the-water testing. 888.773.4889 WWW.QUANTUMSAILS.COM 010114 ©2014 Quantum Sail Design Group, LLC. All rights reserved.